I keep great track of my schedule. I have my iCal synced with my iPhone calendar and I have a backup, tangible copy as well. To say that I’m organized would be putting it mildly. So the opportunity to try out JP Trabbold’s QuickCal Add was not wasted on me. However, as an avid calendar keeper, I simply cannot find a reason for this $1 iPhone and iPod touch app. Just the Facts: QuickCal Add promises to save you time entering events on your calendar by only requiring you to enter an event, date, time, and alarm option. The concept behind QuickCal Add is promising. Entering events into the iPhone’s Calendar app can be tedious and takes precious time out of my day that could be better spent raising my Angry Birds score. QuickCal Add attempts to remedy time-consuming event entry by offering a screen that requires only the event name, date, time, and an alarm option to add something to your schedule. 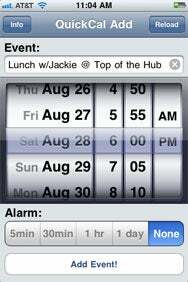 To be fair, the screen is simpler and cleaner than the Calendar app, which has additional options like automatic repeats of an event. While I didn’t conduct any tests to see exactly how many seconds (if any) were saved by using QuickCal Add, I can without a doubt say that it doesn’t win by a significant margin. If anything, the app took me longer, because it doesn’t offer any features that would allow me to check for scheduling conflicts or even view the calendar. Therefore, scheduling an event in QuickCal Add consisted of opening Calendar, checking my schedule, scrolling a page over to QuickCal Add, and finally, recording my plans. If QuickCal Add could find a way to live up to its namesake, I would be first in line to celebrate its success. But as it stands, no significant amount of time is saved, and I can’t seem to justify the $1 download fee.